Biosensors are increasingly penetrating medical, environmental, food process, and biodefense application markets. Development in nanotechnology is revolutionizing the biosensors market across the globe. Chronic health disease rate is increasing day by day. Over 75% of healthcare spending of US is invested in the treatment of chronic health issues. Around 35% of U.S. population is suffering from heart disease. This is impelling the need of advance medical facilities to reduce health issues. Biosensors are proving as an alternative which can transform the clinical analysis and healthcare diagnostics. Governments are taking initiatives for the development of micro fluidics, human genome project and bioscience. Innovative approach towards genetic analysis and protein detection is leading the expansion of biosensor applications in medical industry which is expected to impel the growth of Biosensor Market. For instance, a non-profit association, Max-Planck Institute collaborated together with Federal Government of Germany to implement improvisation and expansion of existing healthcare infrastructure. Also, National Information and Communication Technology Australia (NICTA) are investing in research & development activities for the development of embedded systems which can be used in biosensor industry. Major players of IT industry are extensively investing in healthcare industry. Rising penetration of IT healthcare is bolstering the demand for connected healthcare devices which boost the growth of biosensors market. Advancement in biosensors technology is one of the major factor which is rising the popularity of biosensor based smart healthcare devices. Rising number of heart diseases and diabetic patients in the U.S. is increasing the adoption of advance devices at an early stage. The U.S. generated a 75% revenue share of North America biosensors market in 2016. Adoption of advanced medical infrastructure and huge investment in pharmaceutical research is augmenting biosensors market in the region. Global biosensors market was valued at USD 15.85 billion in 2016 and is estimated to reach USD 28.67 billion by 2024, with a CAGR of 7.68% during the forecast period i.e. 2016-2024. Electrochemical biosensor technology is the dominating segment based on technology and is expected to surpass USD 20 billion by the end of 2024. Electrochemical biosensors contributed over 70% market share in technology segment 2016. 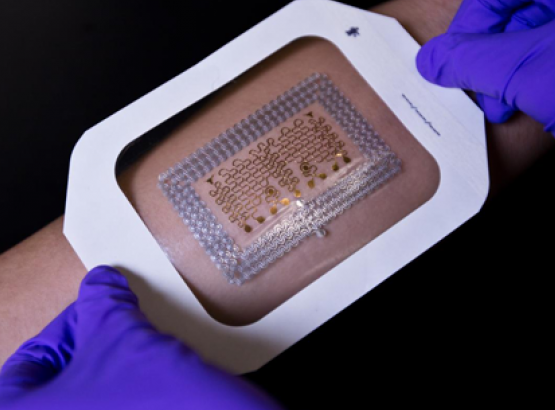 Also, optical biosensors technology segment is estimated to grow at a CAGR of over 8.35% during the forecast period. Wide range of sensors used in monitoring and detection of severe health conditions mainly diabetes and cancer treatment is boosting the growth of global biosensors market. Medical testing application is expected to acquire nearly 70% of revenue share of global biosensors market by the end of 2024. Rising sectors of agriculture testing and toxicity testing in food industry is expected to spur the demand for biosensors over the next five to six years. Point of Care (PoC) testing is the largest market medical testing segmentation of biosensors. Point of Care (PoC) testing is projected to witness lucrative growth, expanding at a CAGR of 7.0% over the forecast period i.e. 2016-2024. Accuracy in testing and detection of health condition is anticipated to drive the popularity and adoption rate of home healthcare diagnostics. Rising health awareness and improvement in health care facilities is contributing to the expansion of biosensors market in Asia-Pacific region. Asia Pacific biosensors market is expected to grow at a CAGR of 10.8% over the forecast period i.e. 2016 to 2024. In Europe region, inclination towards healthy lifestyle and acceptance towards technologically advanced medical products by patients are some of the driving factors which are expanding the growth of Europe biosensors market. High capital venturing in research & development in medical industry is improving the quality of biosensors which leads to generate more demand for biosensors in healthcare industry. Countries such as Sweden, France and Germany have high rate of adoption of biosensors as compared to other European countries. Huge investment in research & development of medical sector is one of the primary growth factors for global biosensors market. Rise in personal disposable income, increasing health awareness and inclination towards quality treatment are some key factors which are triggering the demand for biosensors across the globe. Wide adoption rate of home blood glucose monitoring mainly for diabetic patients is a key driving factor for the positive growth of biosensors market. Emerging trend of using user-friendly compact biosensors is raising the adoption rate of wearable biosensors. Where, The Wearable Biosensors Market is expected to exceed more than USD 26.4 billion by 2025 at a CAGR of 8.12% in the given forecast period. Rise in chronic health issues and cardiovascular diseases are raising awareness among consumers to incline towards sensitive testing biosensors. Technological advancement in micro-fluids and expansion point of care testing device is also contributing to the expansion of global biosensors market. High initial investment in the manufacturing and development of biosensors is the key challenge which is prohibiting the market growth. Miniaturization, sensitivity and variation of readout times in sensors are some major technical obstacles which are hindering the growth of biosensors market. Short life span of bio-molecules used in sensors and expensive manufacturing is limiting the investment from manufacturers. In June 2012, Sorin Group a medical device company and Orange Business Services together launched a product name SMARTVIEW which is capable of remotely monitoring the patients with cardiac rhythm management (CRM) implantation. This solution is launched in several countries in Europe. 8.2.2. Abbott Point of Care Inc.